A cordless phone has many advantages, and they deliver the best when the cordless phone is a a good quality, has good battery life and a strong signal. In all these cases I have found Panasonic cordless phones to be the best. I had a Beetel cordless phone for some time, and also a Gigaset, and they are just no comparison. No wonder that Panasonic cordless phones take up the top ranks int he best cordless phones in India list. 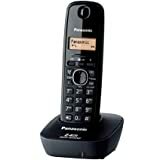 I feel that if you buy a Panasonic cordless phone, you will not go wrong. Just make sure you choose a model that offers the features and specifications that you want. And third get a model with a back-up battery which will ensure that the handset doesn’t go dead in the middle of a call if there is a power cut. The digital technology cordless phone delivers much better sound quality over a larger distance than an analog cordless phone. The sound can be digitally boosted just like digital TVs show a better quality picture than analog TVs. The DECT cordless phone uses a particular frequency and new technology for wirelessly connecting the handset to the base set, that results in very good sound quality, a good wireless range and no interference from other wireless devices in the house. Something that is not there all together in the other frequencies that are used in cordless phones. A back-up battery is good for India, as we often get power cuts, and without a back-up battery your handset will go dead as soon as there power goes off in your base set. However if you are not really affected by a phone conversation suddenly getting cut off, then there is no need for battery back-up, and you can easily do without it. If you take care of these three basics, you won’t really go wrong. If you don’t want to rack your brains with the minutae, just have a look at the Top 10 Best Cordless Phones in India below, and make a choice. Of course, if you want to go into more details, then there are other factors and features that you can consider. Speakerphone are very useful if you want to have a conversation hand-free or if several people want to talk together. There are cordless phones that do not have a keypad on the base set, but some do. The advantage is that if you are on a call and you need to use the keypad, then it is easier to keep listening to the handset and press the keypad on the base set. Some base sets even have back-lit keys that are very helpful in low light, at night or when the lights are off. This can be an important consideration and you need to decide this beforehand. If you think you need more handsets either in your home or if you are in an office, then opt for a multiple handset cordless phone. They usually come with 3 to 8 handsets, and they are powered by AC power. Do make a note here that dual handset cordless phones will only support two handsets and you will not be able to add on others if you buy one separately. Be sure of the number of handsets that the cordless phone system will allow, and whether you can connect a separate handset that you buy. This is a simple and very useful feature. If you can’t locate your handset, just press the locator button on your base set, and an alarm will go off in the handset. The list can be very long with more and more new and advanced features getting added on to your cordless phone, but here are a few more that you can consider before choosing a cordless phone. A good LCD screen is useful; Having the feature if Caller ID can be really useful; Another new feature is a Talking Caller ID, where the name of the caller is announced when the phone rings; An answering device is a good addition if you want an automated answer to go to the caller when you are not available for a call; Call waiting is a useful as it tells you the name of who is calling if you are already on a call; a Voice Mailbox is a pretty standard feature, check for it. Panasonic has always been the leader in cordless phones in India, and today is no different. Panasonic absolutely dominates the cordless phone market. And for good reason too, their cordless phones are absolutely the best in terms of quality and durability. With that being said, you can now look for the best cordless phone, amongst the top 10 in India below. 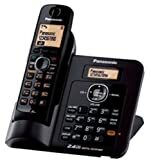 These cordless phones are the top bestsellers and also they are updated every day to reflect only the latest bestselling models. You will only get the latest and the best value for money cordless phones. Of course, when you choose from the Top 10 in India, you get the very best in quality, reliability and performance. So go right ahead, pick your ideal cordless phone today. Illuminated LCD display with alphanumeric keypad. Wall mountable phone, 14 ringer melodies, 6 ringer tones, any key answer, time display and redial. The box includes handset, base, battery, charger and user guide,the batteries must be inserted in the cordless and headset must be placed on the base so that the phone is charged for 7-8 hrs before initial use. 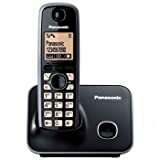 The Panasonic KX-TGD310EB is a cordless home phone that is simple and refined with an array of features including speakerphone, a built-in baby monitor and caller ID. The KX-TGD310EB is everything you need to dial and receive calls and benefits from up to 16 hours talk time. It is Eco friendly due to the base station remaining 'OFF' until a call comes in or a handset is activated, meaning it can save you money on your electricity bills. Due to its simplicity, this phone is ideal for working into family life, and whats more, it has a built-in Nuisance Call Blocker which allows you to block any unwanted calls including specified numbers, unknown numbers and withheld numbers meaning you go about your day safe in the knowledge that you won't be bothered by sales calls and telemarketers. 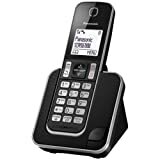 The KX-TGD310EB is sleek and stylish and accepts up to 5 additional handsets which can each be programmed to prevent ringing during specific periods. The phonebook can be shared across each additional handset and all comprise of an easy to read 1.8 inch illuminated display. Panasonic Landline Phones doesn't come with a manufacturing seal. These phones are new and have brand warranty on them. These phones are new and have brand warranty on them.